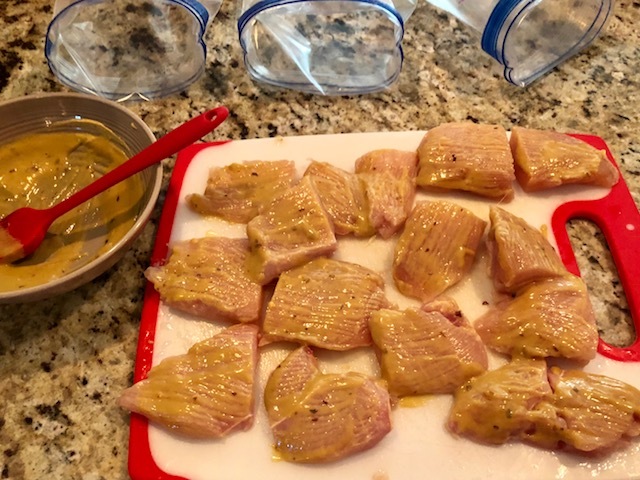 If you’ve been around the blog before, you have probably heard me talking about freezer cooking. I’m a huge fan! 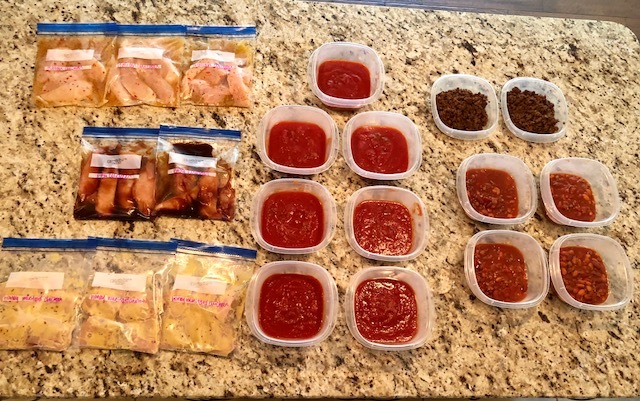 Freezer cooking can be done in a lot of different ways. 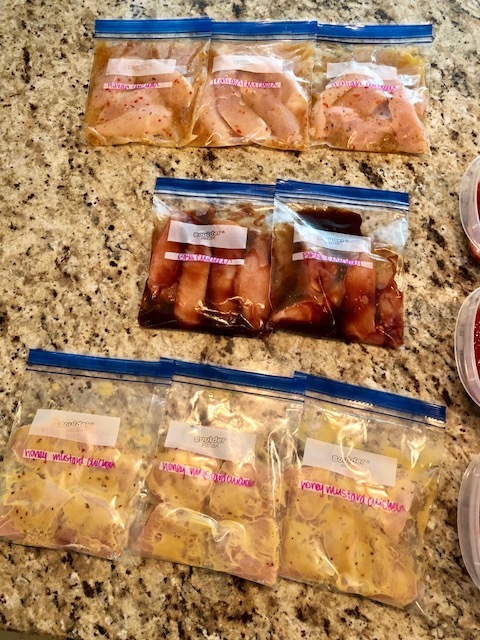 The way I do my freezer cooking is to make a big batch of a few different meals, and freeze them in perfect portions for us. 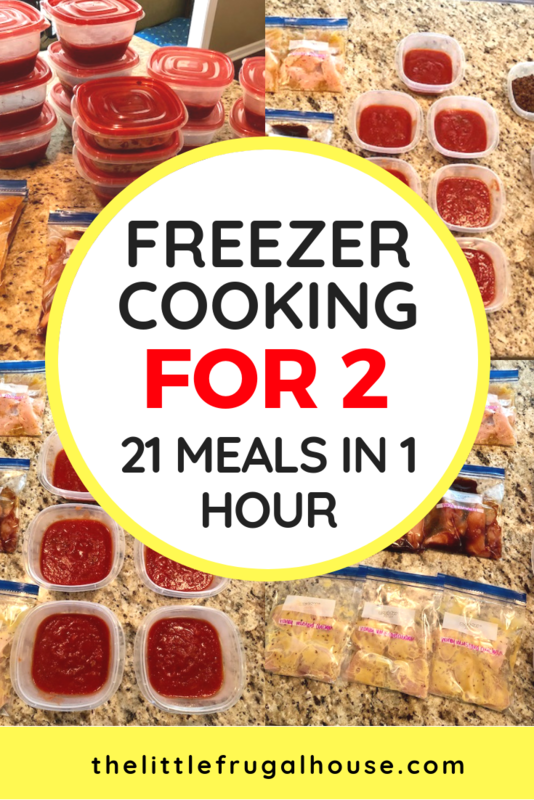 There are just 2 of us, so this freezer cooking plan will show you how a plan for freezer cooking for 2. 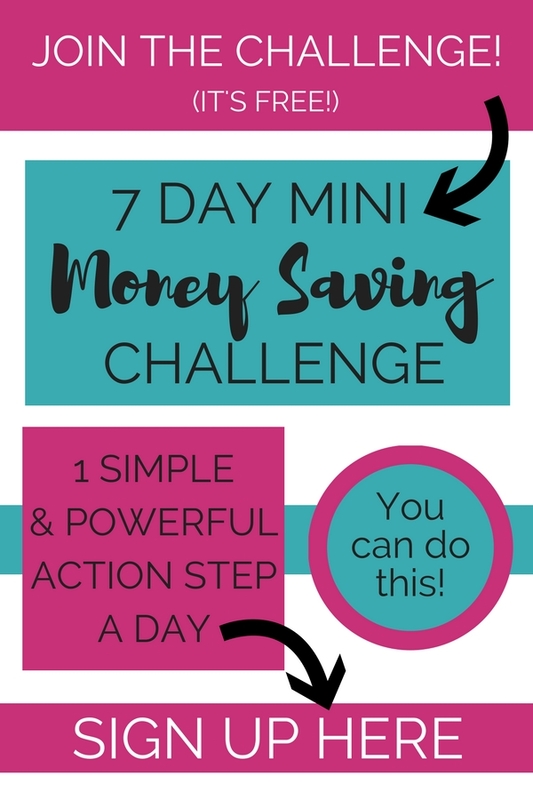 You can use this plan for any family size, but you will adjust how you portion your meals. If your life is crazy busy, and you barely have time to sit down and eat, much less cook dinner, freezer cooking may be perfect for you. 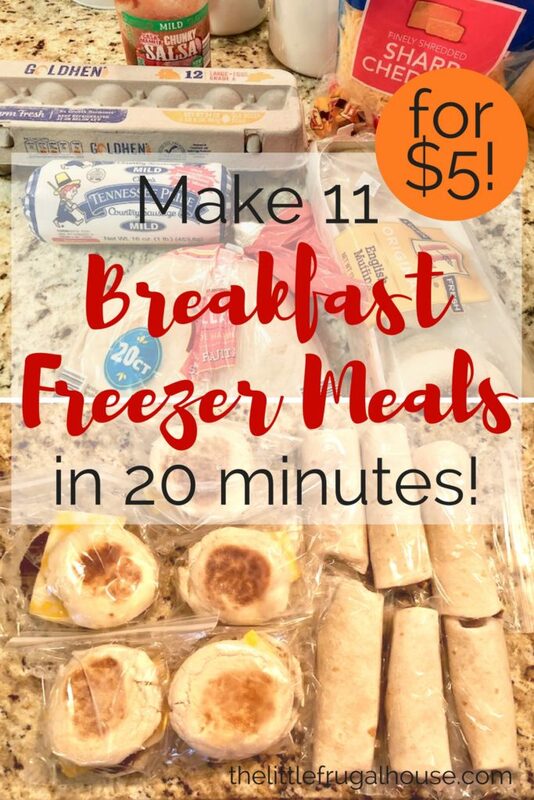 Or, if you are tired of getting dinner at the drive thru every night because you are too tired to cook after a long day at work, freezer cooking will help you. You can make these meals on the weekend, or whenever you have a spare hour, and dinner is ready for 3 whole weeks! 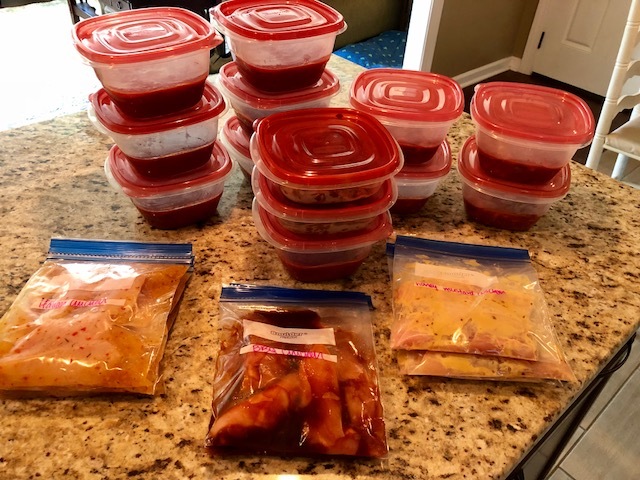 So, 1 hour of cooking = 21 meals ready to go! Are you ready to make 3 weeks of dinners in just 1 hour? 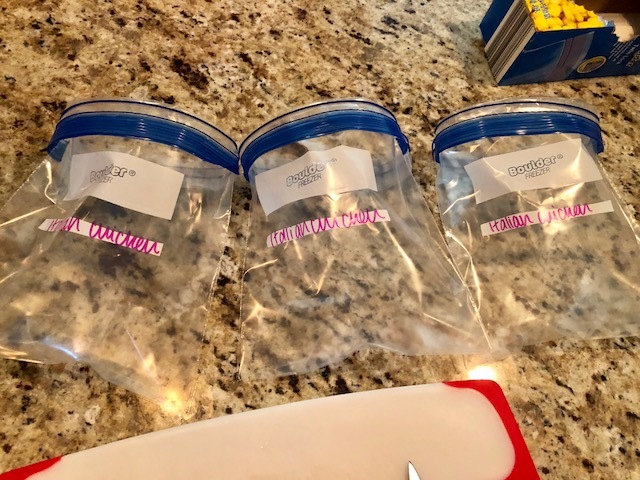 Grab the free PDF printable for this freezer cooking for 2 plan here. 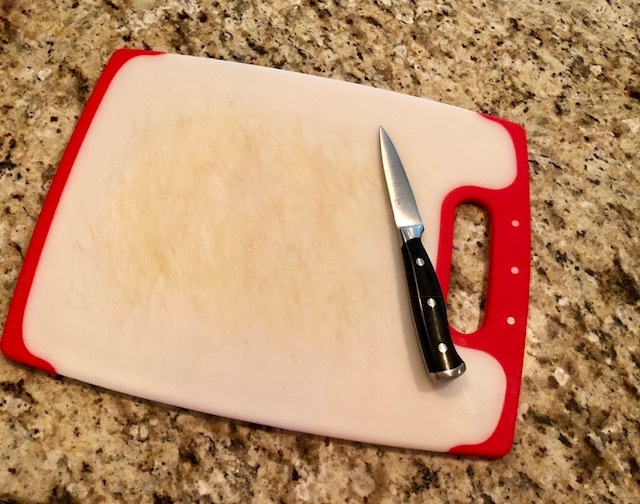 Drain meat on a paper towel to remove grease. 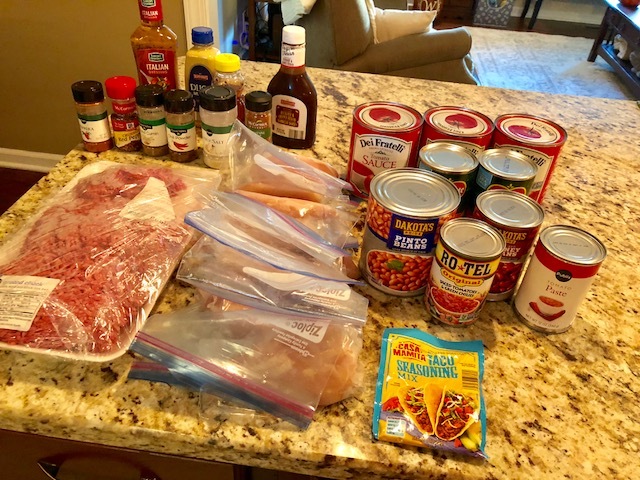 Divide ground beef between spaghetti sauce and chili. Stir and let simmer. Add remaining 1 lb. 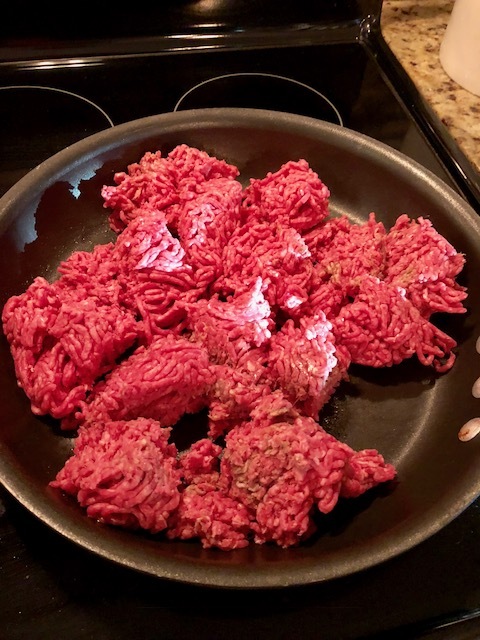 of ground beef to skillet and brown. Mix taco seasoning packet with 2/3 cup of water. 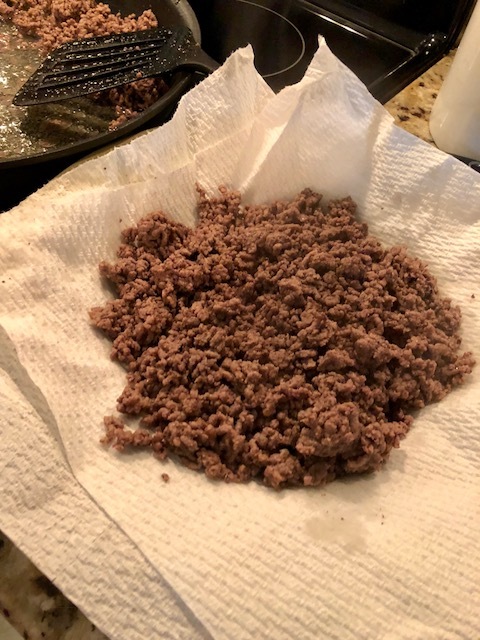 Drain ground beef on paper towel to remove grease. 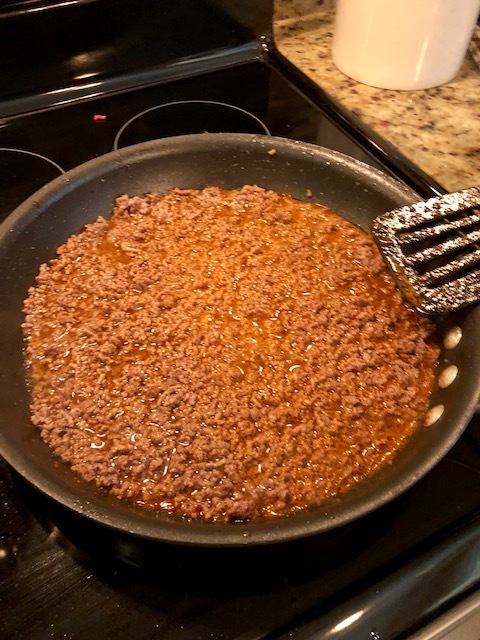 Add back to skillet with taco seasoning. Let simmer. 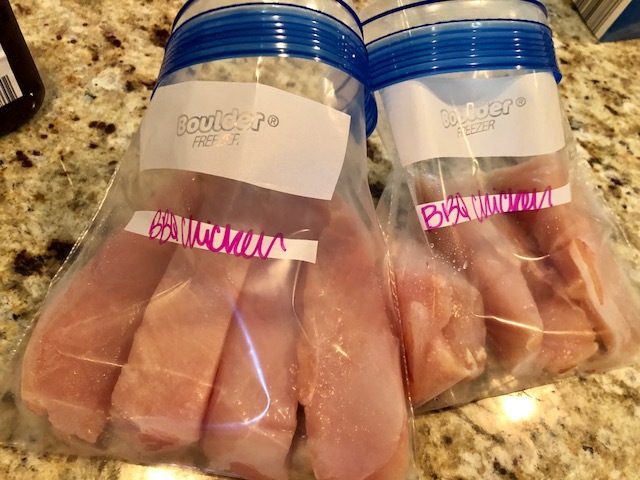 While all the beef meals are simmering on the stove, you can make your chicken freezer meals. 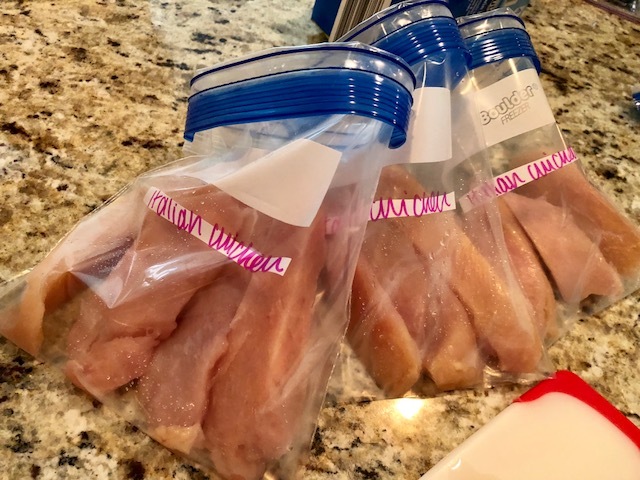 Slice 2 large chicken breasts into 8 tenders. 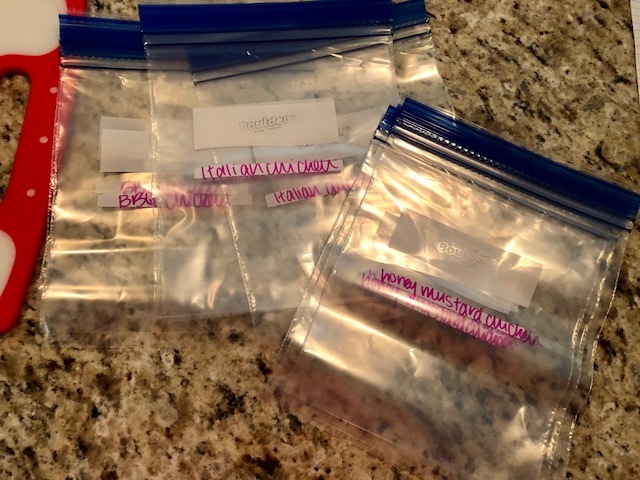 Divide between 2 labeled bags. Add BBQ sauce to bag and rub to coat chicken and seal bag. Slice 3 large chicken breasts into 12 tenders. Divide between 3 labeled bags. 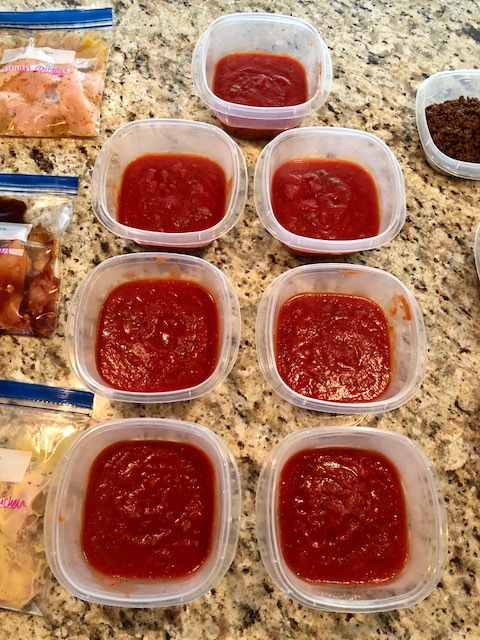 Add Italian dressing to bags and seal. 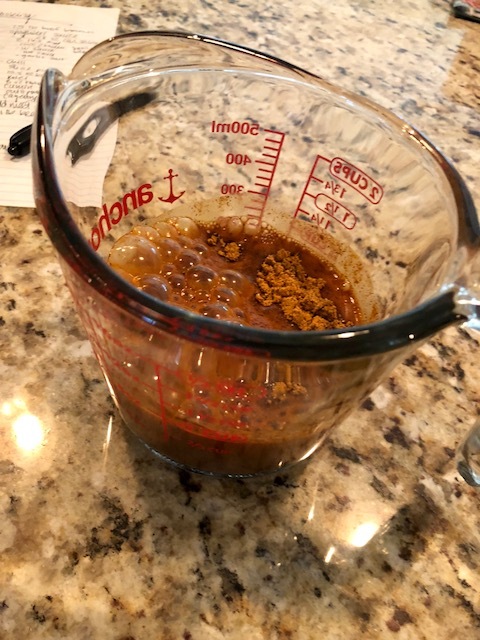 In a small bowl, mix honey and dijon mustard with 1 tsp crushed red pepper flakes and whisk. 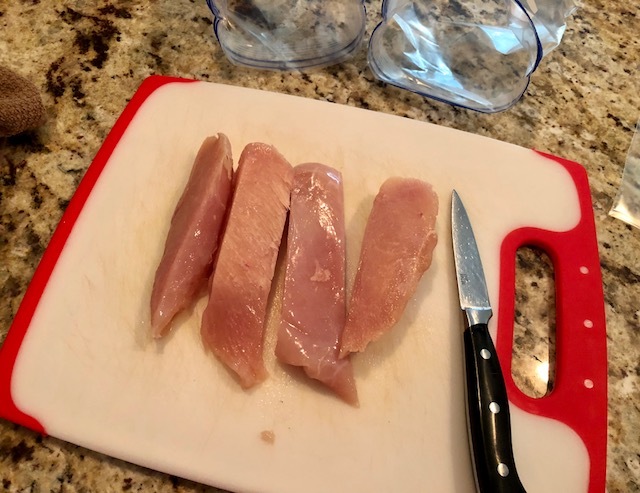 Using 3 large chicken breasts, cut the chicken horizontally to make 2 thinner breasts. Then, cut those in half creating 4 small, thin chicken pieces from each breast. 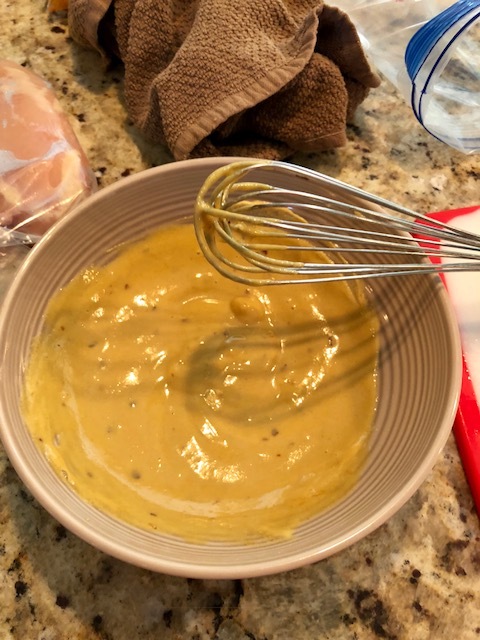 Using a basting brush, coat each chicken piece with the honey mustard mixture. 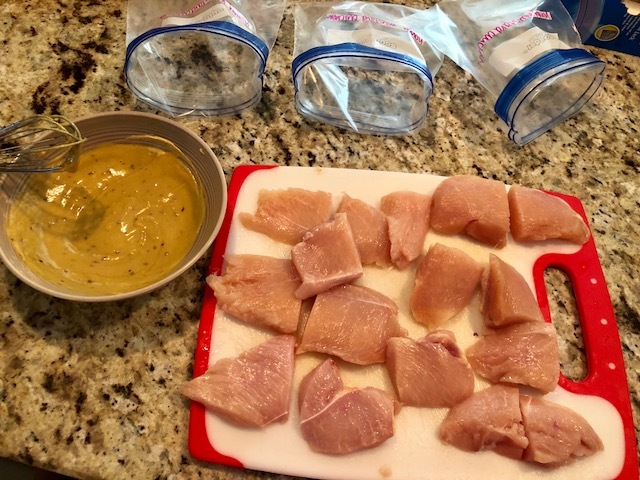 Place 4 pieces in each labeled bag, and coat the other side with the honey mustard. Seal bags. Thaw sauce in fridge overnight. 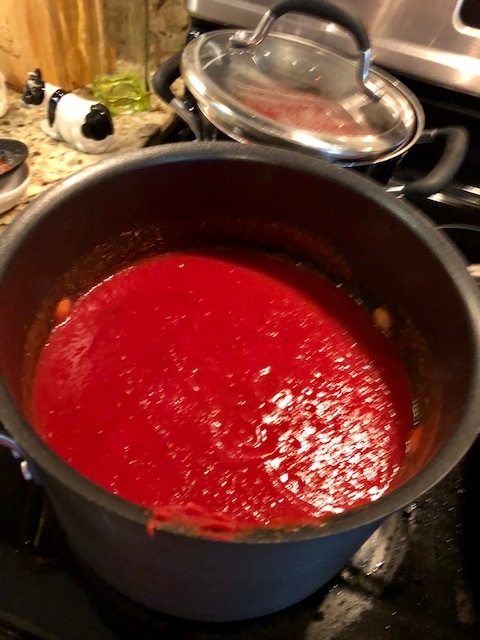 Heat sauce in small pan. Serve with side salad or french bread. 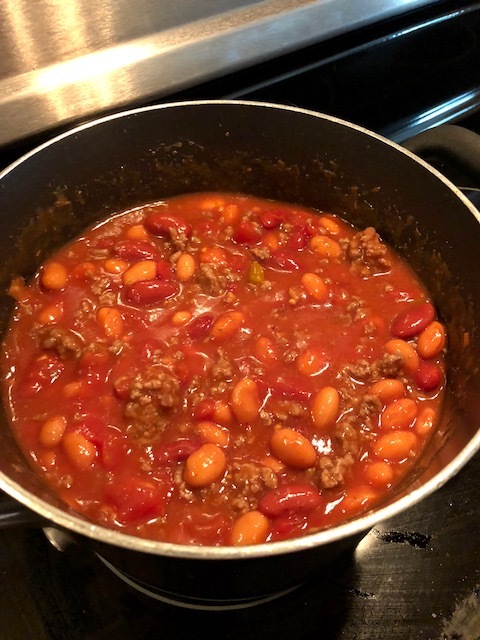 Thaw chili in fridge overnight. 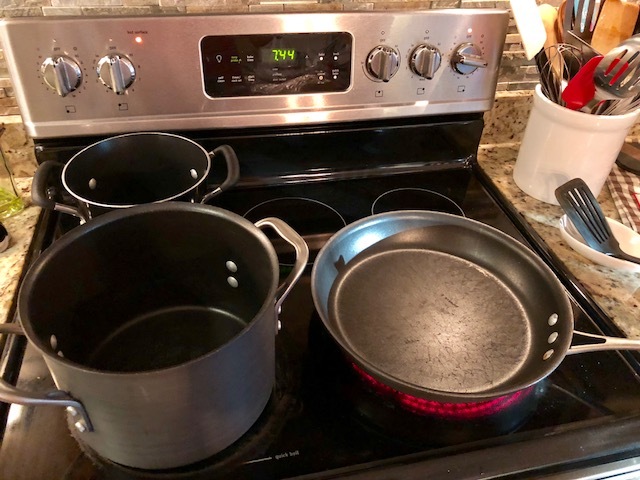 Heat in small pot or in microwave. Serve in a bowl with shredded cheese and Frito’s or on top of hot dogs. Thaw meat in fridge overnight. Heat in microwave until warm. 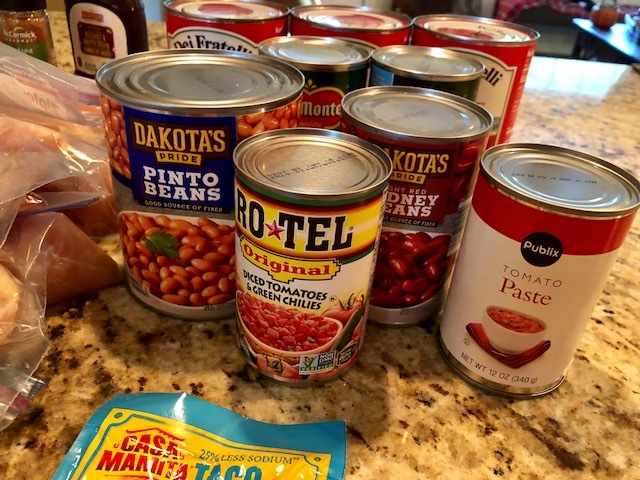 Serve on tortillas with favorite toppings, on nachos, or make a taco salad. *This is the easiest meal to heat up. 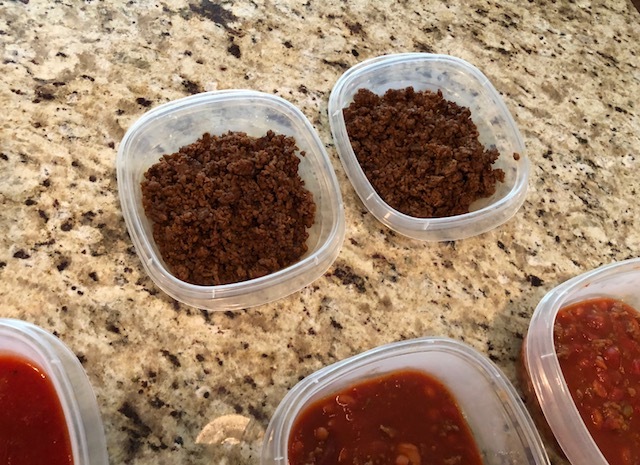 If we ever have to eat dinner alone, I will thaw taco meat so we don’t have to do dishes for just one person! 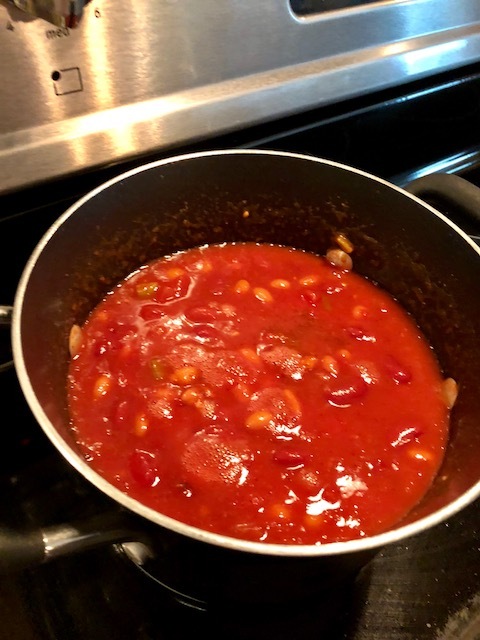 It’s super easy to heat up and no mess! 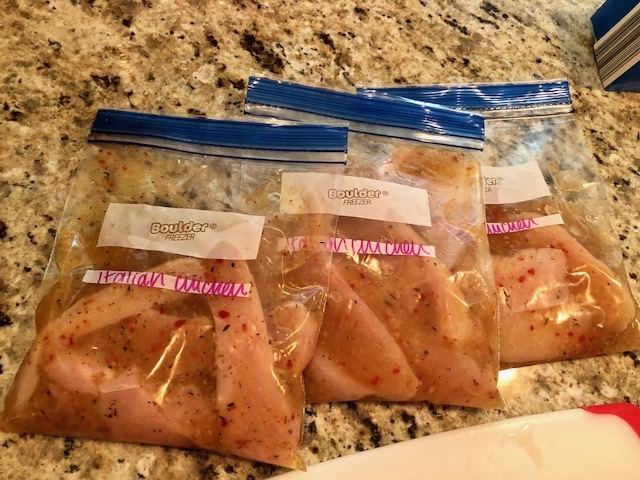 Thaw chicken in fridge overnight. 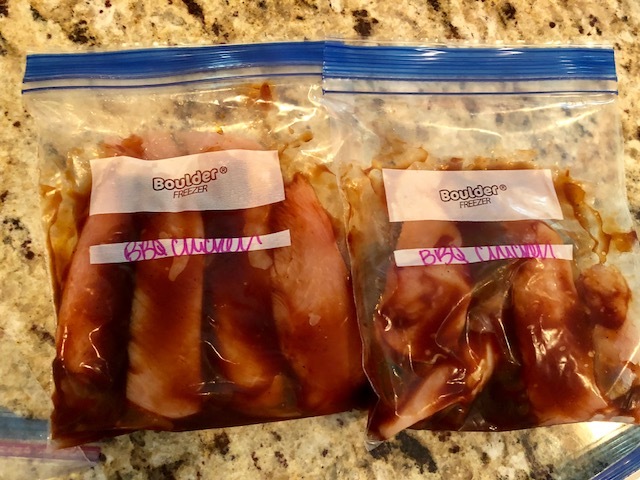 Place chicken with BBQ sauce in baking dish and bake for about 30-35 minutes. Serve with vegetables, potatoes, or a salad. Grill in skillet or on grill until golden brown. Serve with vegetables, potatoes, or on a salad. Grill in skillet or on grill under golden brown. Serve as slider sandwiches on small slider buns. Freezer cooking really makes my life so much easier. I can get dinner on the table every night with little effort. And, it saves us money since we have dinner ready at home, we don’t have to out to eat. And we don’t waste much food at all! 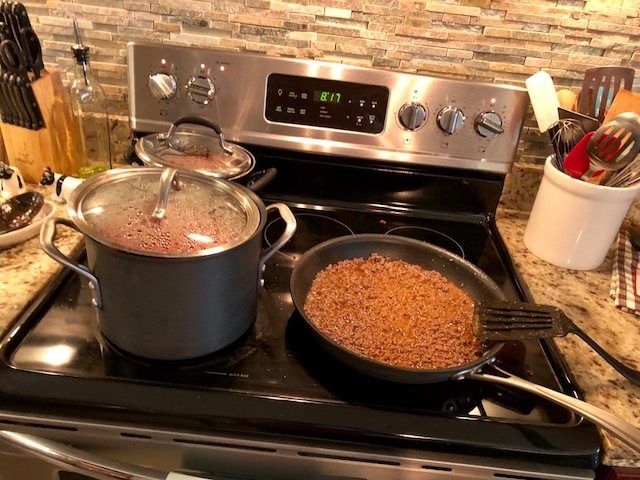 I love just being able to heat up dinner, make some sides, and dinner is ready! And the rest of the night is yours to do what you want! Freezer cooking for 2 doesn’t have to be difficult, just make a big batch of your favorite meals and portion them into 2 person servings. 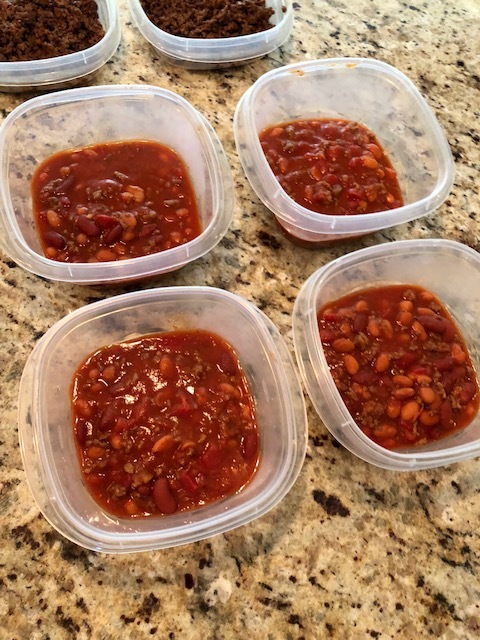 Learn more about freezer cooking! I love freezer cooking so much, I wrote a whole book on it! 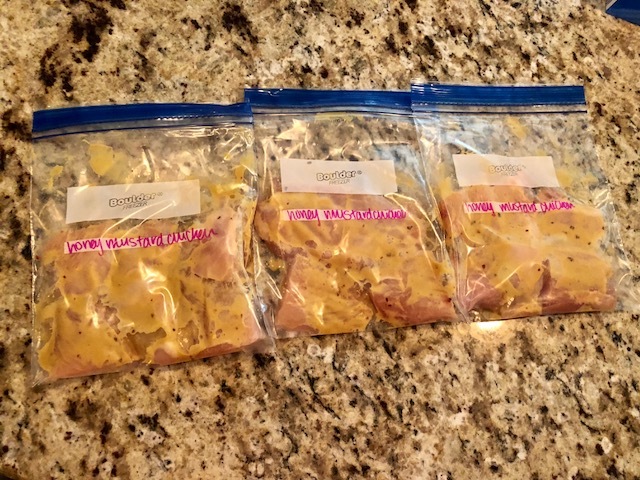 If you want to learn more about freezer cooking, you will definitely want to check it out! 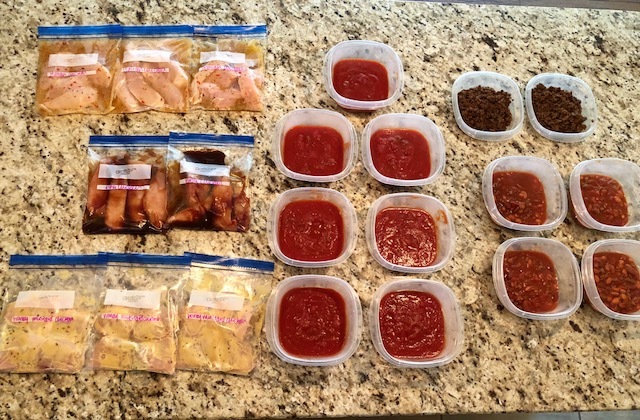 Create More Time with Freezer Cooking is here to help you get dinner on the table every night with little effort. 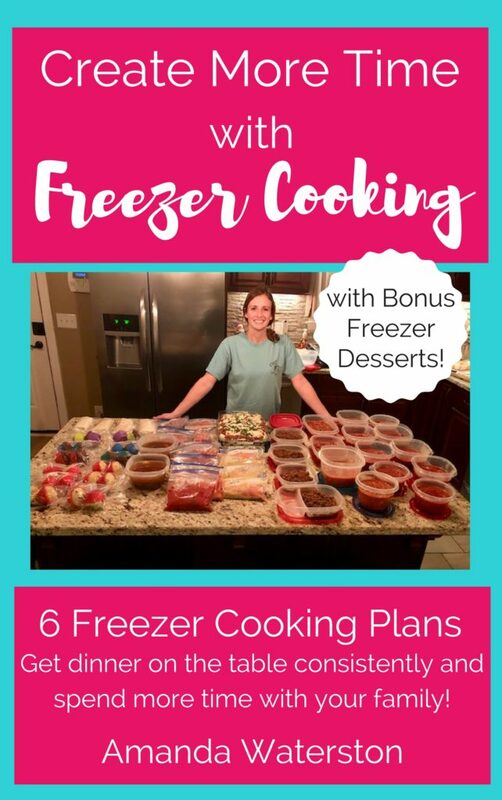 There are 8 freezer cooking plans inside the ebook with shopping lists, directions, and how to finish the meals. 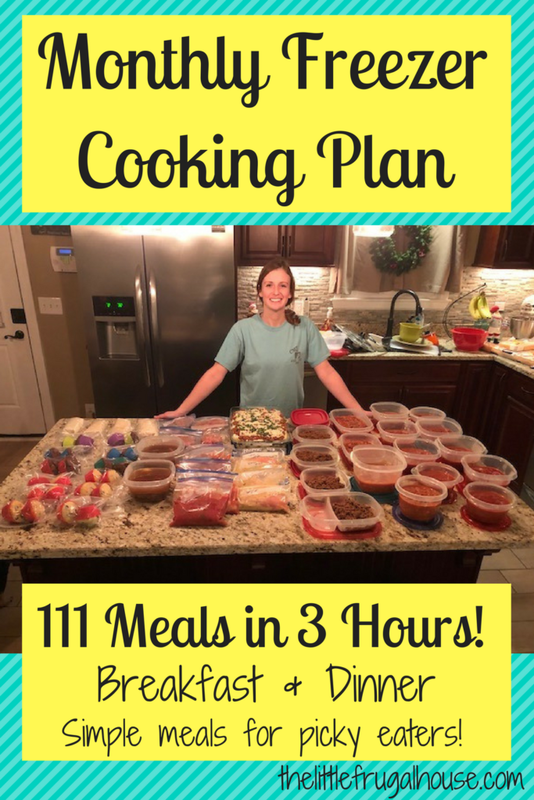 I also included my favorite freezer cooking tips and meal planning tips!